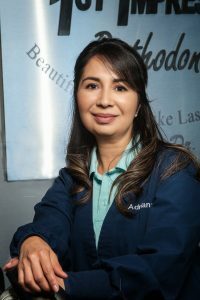 Adriana has been with 1ST IMPRESSIONS Orthodontics since 2013. She is a very kind and talented dental assistant who is also fluent in Spanish. She has previous assisting experience in both general dentistry and pediatrics. She and her husband Larry love spending their free time with their son Austin and their pets. Our patients love her gentle and caring personality.